Do It Yourself Special: FREE plans to add MIDI capability to the Korg MS-20 with the Synhouse MIDIJACK! 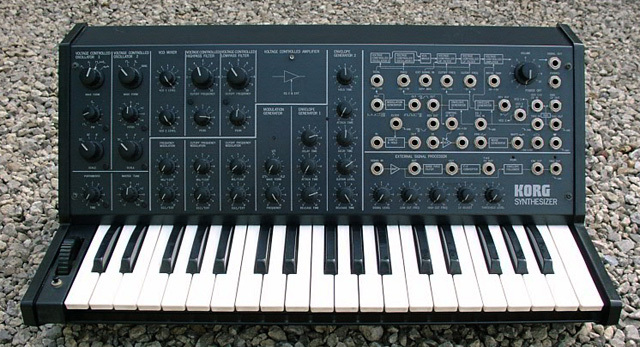 The following plans describe a general method of adding MIDI capability to the Korg MS-20 analog synthesizer with the Synhouse Original MIDIJACK. Later on, a specific method to install the Synhouse MIDIJACK II: Hertz so good! will be briefly described. You can do this yourself if you have a little experience with electronic repair and the soldering of wires and circuit boards. If not, it is recommended that you send the instrument to Synhouse L.A. for a quick, low-cost Factory Installation. All repairs and modifications made to your instruments will be done at your own risk and Synhouse Multimedia Corporation assumes no liability for personal injury caused or damage to equipment or loss of use caused directly or indirectly by the use of these plans. If in doubt, don't do it! 1) Proceed with the installation as described for the Korg MS-10 but make the appropriate changes as they relate to the Korg MS-20. The three manuals supplied with the MIDIJACK will provide all necessary information, as they relate to any synthesizer. 3) Test and calibrate using the procedures described in the Original MIDIJACK Quick Installation Manual. 4) With the Original MIDIJACK, the Korg MS-20 is perfect for computer-controlled live performances with real-time hands-on sound tweaking and patching. The Korg MS-20 is quite a bit different than other analog monosynths and the MIDI control that results from putting an Original MIDIJACK on it is different as well. The Original MIDIJACK is using the Korg's built-in linear-to-exponential converter to get the correct VCO control. To start playing MIDI, you must let the instrument warm up then momentarily press down one note on the Korg keyboard to provide the correct offset voltage. The keyboard intonation can be adjusted with the knob in the FREQUENCY MODULATION section labeled MG/T.EXT. The correct setting will probably be fairly high, between 8 and 10. If the Korg TOTAL input is warmed up and working correctly, the Original MIDIJACK will play MIDI notes perfectly in tune. An advanced user may find it useful to add an extra fine tune trimming potentiometer in series with the MG/T.EXT knob to get finer control and make quick adjustments when temperature changes cause drift. The MS-20 keyboard can be used to transpose the incoming MIDI notes on the fly. 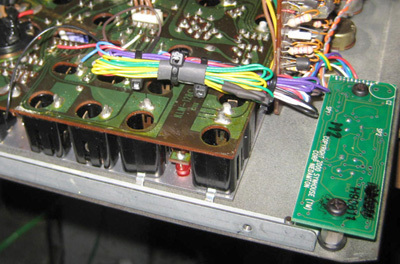 Please note that the MIDIJACK #1 black wire cannot be seen. It may be soldered to any ground point, such as one of the ground tabs hanging from any of the 1/4" jacks. 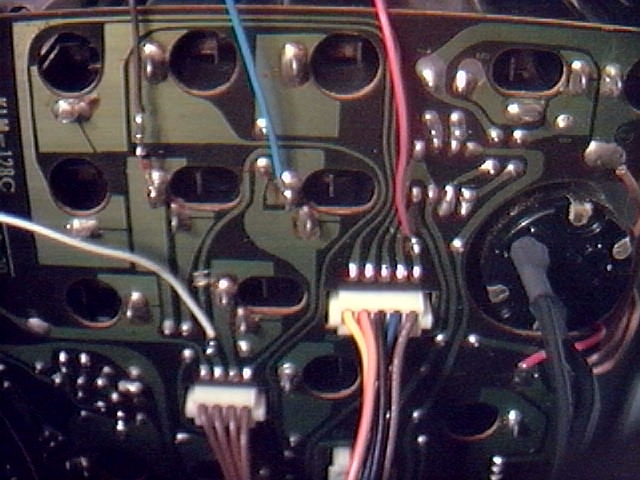 The MIDIJACK #2 red wire can be seen soldered to the trace next to the brown Korg wire above. The MIDIJACK #3 blue wire is soldered to the solder terminal coming through the board from the back of the jack labeled VCO 1+2 CV IN as shown above. The trace coming from that must be cut to break the signal as shown above. The MIDIJACK #4 white wire must be soldered to the other side of the break in that trace, as shown above, where it was most convenient to solder onto the lead of a component coming through the board and trace. The MIDIJACK #5 yellow and the MIDIJACK #6 green wires are not used in the installation and may be taped up. The MIDIJACK #7 brown wire must be connected next. 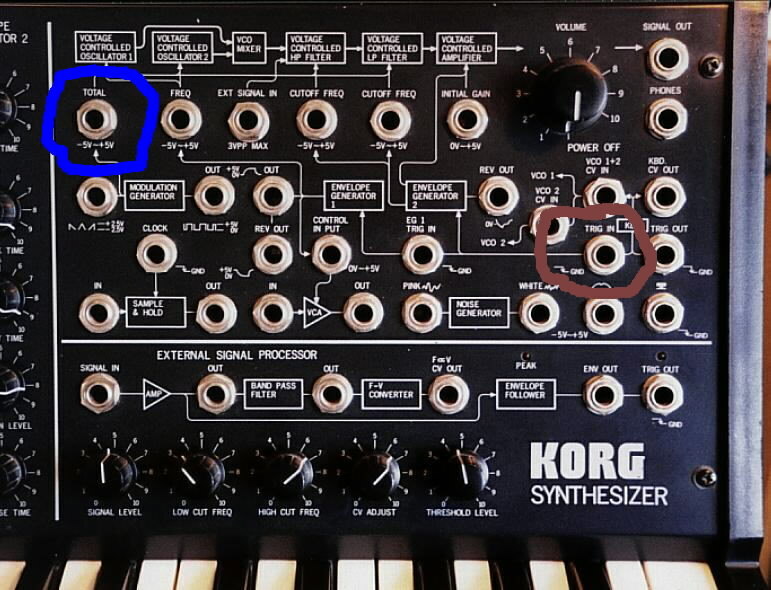 The Korg MS synthesizers use an inverted gate signal similar to Moog synthesizers and the MIDIJACK #7 brown wire (S-trigger wire) works well for this. 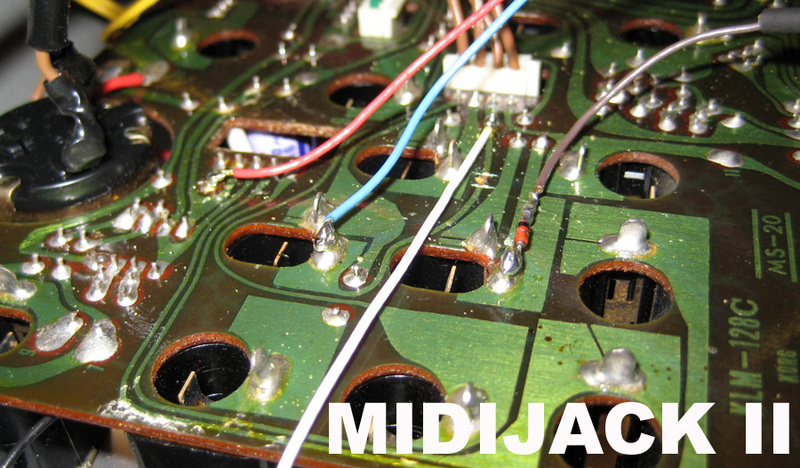 The MIDIJACK #7 brown wire (S-trigger wire) must then be connected in parallel with the existing trigger circuit. A small signal diode can be inserted to isolate the signal so the local keyboard will still work when the MIDI is turned off. The correct type of diode is included with the MIDIJACK in the accessory packet, but may also be purchased locally at any electronics store such as Radio Shack as a 1N914 or 1N4148 or equivalent type of switching diode. Locate the factory Korg terminal which connects to the tip of the TRIG IN jack, which is shown in the photo above. This terminal connects to the tip of a plug inserted in the the TRIG IN jack. Solder the anode end of the diode (the end AWAY from the little black band) to this terminal and solder the MIDIJACK #7 brown wire to the cathode end of the diode (the end with the little black band). 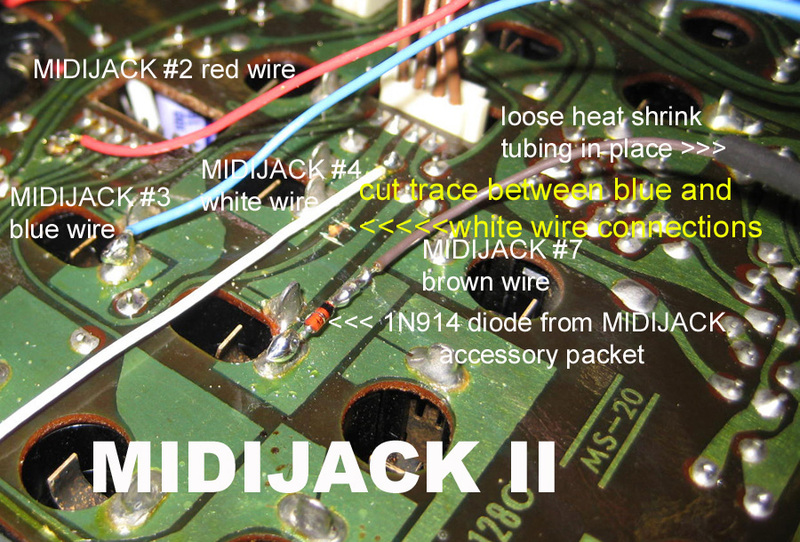 In summary, the MIDIJACK #7 brown wire goes to the band end of the diode, the other end of the diode goes to the terminal on the trigger jack. 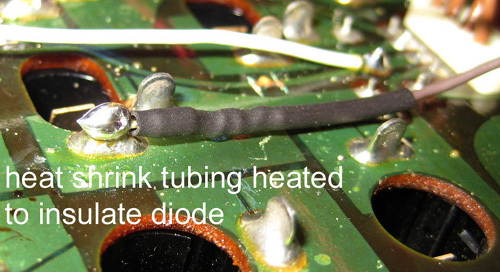 The finished connection with the diode can be seen in the photo above. 3) Test and calibrate using the procedures described in the MIDIJACK II Quick Installation Manual. 4) If this installation method is not immediately and completely clear to you, you should refer the installation to Synhouse for Factory Installation. If an analog synthesizer has the built-in glide function factory wired to be pre-CV/gate jacks, it will not have use of the built-in glide with external CV/gate control. The installation of a MIDIJACK is no different than using external CV/gate control, having no access to the built-in glide. If glide is required for MIDI use, an easy solution for real analog glide is provided in the Advanced Installation Manual, but is beyond the scope of these simple instructions. At this time, the MIDIJACK II is considered to be the far better choice for the MS-20, as it is designed especially for the Hz/v system used by the MS-20 and leaves more synth resources available. New photos were taken during an installation in 2010. For those installing the MIDIJACK II into the MS-20, these photos (posted below) will give a more direct, quicker understanding of this relatively simple task than the previous instructions (above) that required a reading and understanding of the MS-10 installation, then understanding how the MS-20 is slightly different, then referring to the general manuals, etc.. This shows all connections that must be made in this installation, shows them all in a single view, and shows how all of this work is done in a tiny area of a single MS-20 circuit board that is only 4" x 6". To make this even easier, the instructions are noted directly on the photos themselves, and multiple views are given to be sure of what you are seeing. When you dismantle the MS-20, use a lot of care and follow the instructions above, but note that there are 18 screws to remove when taking it apart (not including the ground strap screw/washer/nut). There are seven screwed through the right side plastic, seven screwed through the left side plastic, and four along the lower edge in the rear. Be sure notto remove more than 18 screws, or else things will fall apart and more reassembly will be required than necessary. For example, don't remove all the screws from from the underside (just the one forthe ground strap, after undoing the others), and don't remove the two extra screws screwed through the left side plastic nearest the pitch wheel, those hold the pitch wheel assembly in place, and this quick installation doesn't require any access to that. Please use a lot of care in your soldering and trace cutting. Although the MS-20 isn't quite as poorly made as the Roland MC-202, which is the absolute gold standard in garbage synth construction, it still has some major components made of embarrassingly low grade, low quality materials. Unlike Roland, at least the Korg MS-20 is in a box that is half metal and has good quality pots, but the MS-20 PC boards are of a quality grade that is about a thousand steps below the quality of the Synhouse MIDIJACK circuit board. Instead of being made of FR4 epoxy impregnated 94V flameproof fiberglass as anything from any decent company is, the PC boards that Korg used in the MS-20 (and no doubt hundreds of other products) are made of paper phenolic. PC boards made out of this material are about as durable as stale saltine crackers. This is a grade of material so low that it is doubtful that a reputable PC board vendor in the United States could even supply it. In the MS-20, these are worse than most, being more like syrup-varnished graham crackers. The whole thing is covered in some gloppy varnish (perhaps some sticky, feeble attempt at soldermasking), and is not defluxed at all, so there are little dots and spots of gloppy varnish and solder flux all over it. Use a lot of care when making trace cuts and solder joints, and try to use as little heat as possible, because this crap delaminates and curls up in an instant. The notes in the photo above are nearly the complete instructions for this installation. The original instructions said to use electrical tape for this purpose, which is still okay, but use heat shrink tubing and a heat gun instead if you have it, as it will never fall off or become gooey and sticky. Except for the DIN jack for MIDI input, the entire installation takes up less than 4" x 6", and, if done this way, can be done without removing any circuit boards from the synth. This saves a lot of time. The DIN jack can go anywhere, but the lower rear right opposite the AC cord is still the best place to put it. When you needed MIDI control, you could patch them any way you like. This configuration would actually make for an easier installation than the intended method which bypasses the keyboard automatically.